But you know how you feel like you need to say it out loud once in a while? Yeah, this is my "saying it out loud". ﻿I've been wanting to write this post for a while. This post is coming from that part of me that says, "you should feel guilty." But I have this guilt...like a huge amount of guilt. I feel like I need to clear up a misconception of who people perceive me to be. I don't do it all. Yes, I go to work everyday. I'm a parent. I'm a spouse. But, my hubby does (and is), too. I know. I go to school at night. He does so much more! He washes, dries, and folds the laundry. He takes care of the kids. He gets gas for the car. He does the household budget. I DEFINITELY DO NOT DO as much as he does. Actually he does all the stuff I don't like to do. So...I feel guilty that I don't do it all. And he thinks I'm ridiculous. I'm not okay with it, but he is for some reason. I think you need to realize that your minimum is still more than some people will ever do as a maximum. It's okay to feel like you don't do enough, but but take the time to remember that there was probably a time when the hubs didn't do as much because he was in school. Different rolls for different times. Also, Ammon needs to come learn how to cook at your house. 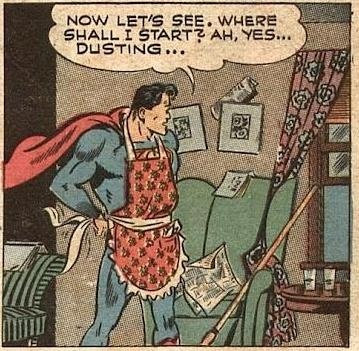 He has the cleaning thing down, but he really couldn't cook if it meant saving my life, let alone his. It's an issue ;-). I feel very similar. I do most of the household stuff and the budget, but mike does everything outside, washes and dries the dishes, and makes my breakfast every morning. It makes me feel small, like I'm using him somehow. He says I'm being ridiculous. I think it's a cycle. We pick things up and then put them down. It's ok. Your hubby sounds like mine. PAULito does the brunt of things around here, while I just skate by.